Who Said Sonic Prefers to Travel on Fast Feet? 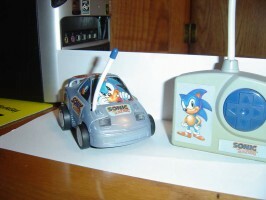 Before Sonic & Sega All-Stars Racing, and before Sonic Drift, there evidently was this–Sonic crammed in a small RC car for your personal entertainment. You can own such a thing through EBay. It allegedly hails from 1993, according to the Ohio based seller. Made by Nikko, Sonic looks a bit crammed in the car, remote controlled, but it still works and in “great shape,” says the seller. For the current asking price of $99.99, and the cost of shipping and handling cost which the buyer also is responsible for, it better me. We’ve relayed some pictures of the parcel below. If you’re interested in a purchase, the sale ends in two weeks.